The XVIII Airborne Corps, with Headquarters at Fort Bragg, was originally activated as the II Armored Corps at Camp Polk, Louisiana, January 17, 1942. It was redesignated XVIII Corps October 9, 1943, at the Presidio of Monterey, California. The Corps celebrates it's birthday August 25, 1944, when the blue airborne tab was added at Orbourne, St. George, England. On this same day, the XVIII Airborne Corps assumed command of the 82d and 101st Airborne Divisions. 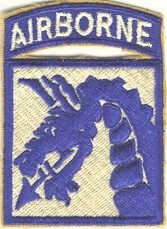 XVIII Airborne Corps was placed in the First Allied Army, under the command of Lt. Gen. Lewis Brereton and within a month, Major General Matthew B. Ridgeway, the first Corps Commander, sent his men into action in Operation Market Garden, the allied invasion of the Netherlands during World War II. When the XVIII was activated, Brig. General James Gavin (Pictured as a Major General, Left) commanded the 82nd Airborne Division, while Major General Maxwell Taylor, (Pictured Right) commanded the 101st Airborne Division. 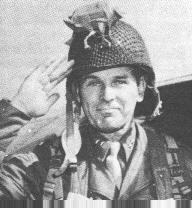 On March 23, 1945, XVIII Airborne Corps participated in the largest single airborne drop in history codenamed Operation Varsity. Along with the British 6th Airborne, the 17th Airborne participated as a unit of the XVIII Corps in Operation Varsity and helped secure passage into the heart of Germany. 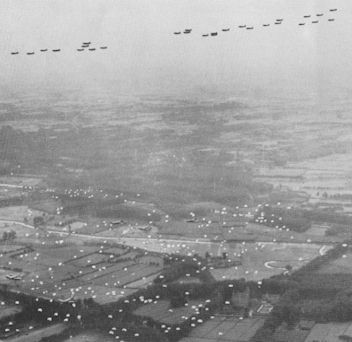 More than 20,000 paratroopers dropped on Wesel, Germany. The 13th Airborne Division was able and willing to jump during Operation Varsity, but there were not enough transport aircraft available to allow them to jump. This Operation cost the lives of almost 2,500 paratroopers and gliderman. 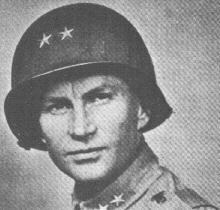 More than were lost by the 82nd Airborne and 101st Airborne on D-Day.